It is not easy to introduce only a touch of it without going over board, while still maintaining a classy feel with longevity in more formal spaces. 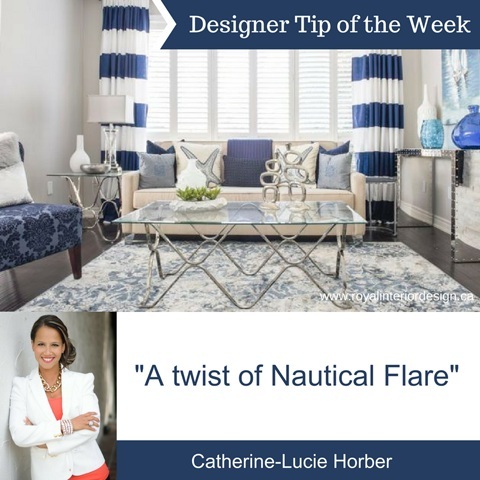 I find that if you choose one or a select few items that are strong enough, yet versatile and only use them sparingly in the space, you can achieve a nautical touch without over doing it. In this living room, we designed it around a very classy, neutral base with pieces containing chromes, glass, cream sofas, classic navy damask chairs, light grey on walls, classic rug etc The main elements that bring in the strongest nautical flare are the bold horizontal stripes in the drapes which make a powerful statement and the sail boats on the artwork along with two little starfish pillows. The rest is all neutral and versatile and not nautical at all. Should you tire of that theme in a few years, the elements are easily interchangeable, which is what you want to make sure of when designing themed spaces, that you still give yourself the flexibility of switching it up later on should you tire of it down the road. I really enjoyed pulling this room together, it actually turned out to be quite an elegant show stopper and a pleasant, delightful treat to the eyes. Sometimes a theme can just be the beginning of an inspiration or direction or just a "flare" it doesn't have to be everywhere in order to work!